Did you miss Part 1 of this blog post? Check it out! 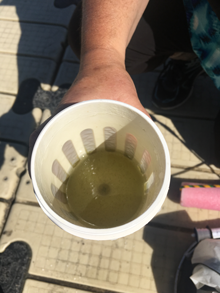 While Sue is collecting the tow sample (the name given the sample collected by the plankton tow net), Robyn has been checking various water quality parameters: temperature, pH, secchi depth (a measure of water clarity), and she collects a water sample to be analysed later at a lab for calcium content. Robyn explains to me that calcium is particularly important because mussels prefer and thrive in water with calcium levels above 25 mg/l, due to needing the mineral to grow their shells. 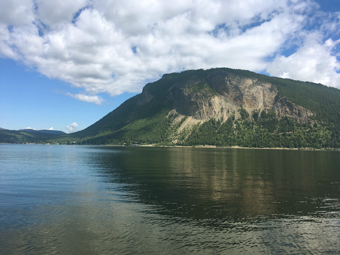 As it happens, Shuswap and many other lakes in the BC Interior have calcium concentrations in the ideal ranges for mussels to grow and thrive – a factor that only increases the threat of a mussel invasion. Next, I observe Robyn as she checks for new signs of adult mussels established on the dock. Robyn explains, as she wipes a finger on the dock piling submerged under water, that small mussels will feel like grains of sand stuck on the piling. She moves from piling to piling doing this test and fortunately doesn’t feel anything gritty. This simple test could indicate newly established adults; once they’ve been in place for a while and grown, they would be visible to the naked eye (adult zebra and quagga mussels grow to about the size of your thumbnail). 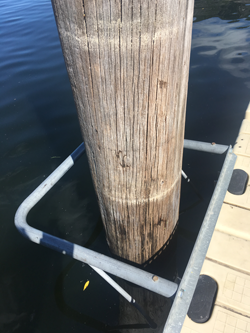 This dock piling is an ideal place for mussels to cling to and colonize on. Meanwhile, Sue has emptied the contents of the plankton tow net four times into a sample bottle. The monitoring at this site is now complete. We pack up the equipment and walk back to their truck. Sue preserves the plankton sample with isopropyl alcohol and labels the bottle; their sample records are logged in their iPad and in a paper log-book. From Canoe, we travel to another monitoring site in Sicamous. All the same procedures for veligers, adult mussels, and water quality are performed again, but this time with one additional step: checking an artificial substrate monitor that CSISS has installed in the lake at this site. The substrate monitor is a simple but clever design: several pieces of PVC pipe of different sizes, no more than about 30 cm long, and some sheets of plastic mesh tied to a rope and hanging in the water at different depths. The pipe and mesh are ideal substrate for veligers to encounter and colonize on, and grow into adults. Robyn hauls up the substrate monitor, and performs the same ‘feel test’ checking for a gritty or sandy texture. CSISS director Robyn Hooper is checking this artificial substrate for signs of adult mussels. Small, newly colonized mussels would feel sandy to the touch. Once more, we head back to the truck to preserve and label the samples. Sue explains that the samples will be shipped to a lab where they will be analysed for veligers. There are 10 sites on Shuswap and Mara that get tested throughout the summer for mussels; there are an additional 13 lakes in the watershed that are monitored including White Lake, Gardom Lake, Skimikin Lake, Joyce Lake, and several small shoal lakes in the high country west of Salmon Arm. 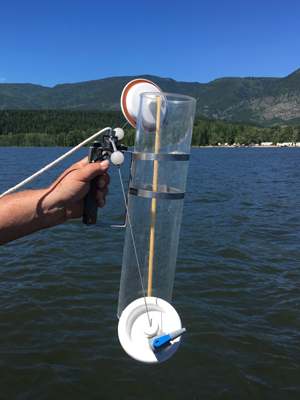 CSISS isn’t the only group doing this monitoring in the Shuswap watershed; the BC Ministry of Environment and Climate Change Strategy also does some. The monitoring plan is implemented by both organizations, and supported by several funders including the Shuswap Watershed Council. I ask how to clean and decontaminate the plankton tow net. Sue responds that it’s an important step that can’t be overlooked. The field equipment gets a double decontamination treatment of vinegar and bleach. This prevents two things from happening: 1) it eliminates the chance of dipping a contaminated net into another body of water, and spreading mussels, and 2) it eliminates the possibility of getting a ‘false positive’ in a subsequent sample – that is, a sample that incorrectly indicates that mussels are present. My part in the field day has come to an end, but Sue and Robyn are off to check one more site on Mara Lake. We didn’t see anything today to suggest that mussels have established in the Shuswap watershed, and it’s our hope and endeavor to keep it that way. We hope you found this to be interesting and informative. You’re welcome to email the SWC’s program manager, Erin Vieira, with any questions you have about Zebra and Quagga Mussels. If you’re a boater, please remember to always Clean Drain and Dry your watercraft every time you move from one water body to another – this applies to boats of all kinds, kayaks, canoes, paddleboards, and personal watercraft such as Sea-Doos. What’s more, stop at watercraft inspection stations as you pass them by in your travels. This ensures you aren’t unknowingly moving invasive mussels. It’s July – boating and summer tourism are nearly at their peak in the Shuswap. The sun is shining, the water is clear and cool – it’s a perfect day to be at the lake. I’m heading to the beach at Canoe where I’ll be meeting two staff from the Columbia Shuswap Invasive Species Society (CSISS) to learn about and help with monitoring the lake for invasive zebra and quagga mussels. We hope to NOT find any evidence of them – thus ensuring the lakes here can be enjoyed for a long time to come. If you haven’t heard of zebra and quagga mussels, what you need to know is that they’re small but incredibly destructive. They don’t exist in the Shuswap, or anywhere in BC or Alberta – but they are found in Ontario and Manitoba, and in Arizona, Utah, and other US states. It’s really important we keep them out of BC because the mussels cling to and colonize everything and anything under water: pipes, dock pilings, boats, and more. There’s no way to permanently get rid of them, and they multiply prolifically. Shuswap Lake doesn’t have invasive mussels, but the threat persists because mussels “travel" around attached to watercraft or in standing water (such as in ballast water). Shuswap is a very popular boating destination and receives a lot of boat traffic from all over the continent – that’s why the risk is significant. There are now steps in place to prevent an accidental introduction of mussels as well as monitoring to ensure they haven’t taken up residence here. You can read more about the mussels and prevention measures on Invasive Mussels – the rest of this article will focus on monitoring for them. I meet Robyn and Sue from CSISS at the Canoe boat launch and we get started right away. The monitoring is a two-part process: checking for “veligers” (mussel larvae, which are microscopic and free-swimming) and checking for adult mussels. Sue begins with collecting samples to check for the presence of veligers. She launches a plankton tow net off the end of the dock into the water: it’s a conical-shaped net made of 64-micron mesh, a few feet long with a collection cup at the bottom and attached to a rope. The net sinks slowly in the water, and she waits for it to reach a depth of six metres, then she hauls it slowly back toward the dock. Sue hauls up the net and rests it on the dock. She removes the collection cup to take a look: it’s a somewhat soupy, greenish liquid. The net has just filtered approximately 400 litres of lake water, and we are looking at a sample of plankton. If there were veligers in the collection cup, we wouldn’t be able to see them with the naked eye. Sue carefully pours the contents of the collection cup into an empty sample bottle, then re-assembles the net and launches it into the lake a second time. The collection is repeated three more times for a total of four samples. This procedure is prescribed by the BC Ministry of Environment and Climate Change Strategy’s 2018 field sampling protocol, and any organization doing invasive mussel monitoring in BC will be following these same procedures. Read Part 2 of the post. 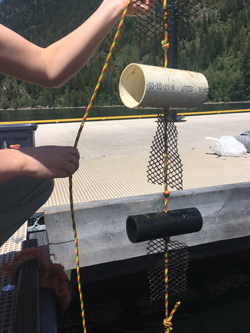 This three-part blog series is all about the day Erin Vieira, program manager for the SWC, joined members of the Shuswap water monitoring group for a day of monitoring in Salmon Arm Bay in June 2017. 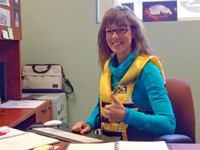 Erin usually works from her office in Kamloops (where she doesn’t wear a PFD, despite photographic evidence to the contrary). It’s 9:40 am. I’m waiting at the Salmon Arm boat launch for my hosts, two staff from the BC Ministry of Environment, to arrive. They’re driving in this morning; I’ve just arrived from Kamloops. It’s currently 21C with a steady breeze blowing. It’s supposed to get up to 26C today – pretty perfect conditions for being on the water. This will be my first time water quality sampling in about 10 years. They pull up with their vessel in tow. One of my hosts immediately has to take a phone call related to a report of an algae bloom elsewhere in the BC Interior. Our day on the Shuswap may get cut short if the emerging issue needs to be investigated. We load the boat with our supplies: sample containers, coolers with ice packs, sampling equipment, lunches and water, notebooks. They launch the boat, and I climb aboard. There are three of us on board: a biologist who will double as the captain for most of the day, a water technician and myself. The first order of business is to go over safety procedures with me, as I’m the only inexperienced person on board. We are donning our Personal Flotation Devices – sleek, comfortable, red, inflatable PFDs. We review the safety equipment on board, we go over procedures to follow in the event of a fire and how to use the radio to call for help, and I’m given an overview of the vessel’s navigation system. We proceed slowly out of the Salmon Arm marina. We are heading for a "deep station" near Sandy Point, a short boat ride from the marina. 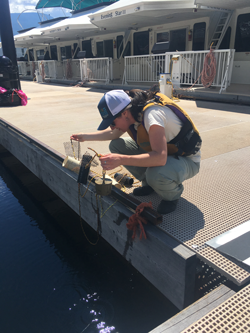 The deep stations – there are several of them throughout the watershed – are long-term monitoring locations where water quality samples are collected and analyzed for various parameters such as nutrients, ions, metals, dissolved oxygen, temperature, pH, plankton and more. 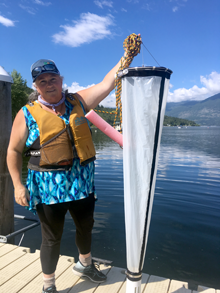 Water quality monitoring at deep stations provides a very good picture of the overall health of the Shuswap lake system. Despite being called a station, there isn’t actually anything there of course – it’s just a location. We arrive at the deep station, guided by the navigation system. This is the deepest spot in Salmon Arm Bay at 63 metres. The water technician prepares the profiling equipment: it’s an electronic device called a sonde that has multiple probes attached that measures dissolved oxygen, temperature, turbidity, pH, and specific conductance. She lowers the sonde into the water, one metre at a time, and takes a reading from the hand-held controller that’s attached to the sonde via a very long cable. This procedure takes about 20 minutes. I’m alerted to one of the challenges of sampling on open water: it’s windy, and the captain is constantly countering the effects of the wind on our vessel to keep us from drifting away from the station. We’re bobbing on the waves, and the water tech is recording water quality parameters in a log-book for various depths in the water column. These measurements need to take place first as they inform the depths from which the other water quality samples will be taken. The measurements from the sonde indicate that the "thermocline" is located between six and seven metres today. The thermocline is the place in the water column where the water temperature changes abruptly. The first six metres of water are within a fraction of a degree of each other; then, at 7 metres, we see that the temperature has dropped by four degrees. The temperature continues to drop rapidly with increasing depth, then at 12 metres it tapers off and once again there is little change to the bottom of the lake. This is an important concept in lake ecology. In essence, the lake waters are divided into three regions: the "epilimnion" is the upper-most region; the "metalimnion" or thermocline is the middle region; and the "hypolimnion: is the lower-most region. Throughout the year, the degree to which these regions mix with each other and the depths they occupy in the water column will change. There’s a lot more that could be said about these, but I’ll leave it there for now. Next, the water technician takes a Secchi disk measurement. 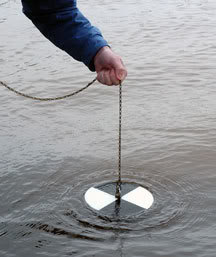 A Secchi disk is a simple and commonly used device in water quality monitoring. It is a dinner-plate-sized disk divided into four wedges alternating black and white, and attached to a rope. It gets lowered into the water slowly, and the depth at which the contrasting black-and-white wedges are no longer visible under the water is the Secchi disk depth. 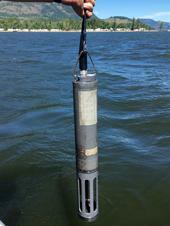 It is a low-tech method for measuring water clarity. It’s now time to collect deep station water quality samples. The biologist and tech switch positions in the boat. The biologist readies the collection device: a Van Dorn water sampler. It’s essentially a tube with closing mechanisms on each end. He will lower the Van Dorn to the desired depth, trigger a mechanism to seal the sampler, and then haul it up to the surface. Then, he’ll transfer the water samples to pre-labelled bottles. The samples will soon after be analyzed for nutrients, ions, metals and bacteria. In perfect weather conditions, a water sample would first be collected from the epilimnion and then the hypolimnion. However, the wind is picking up, so the hypolimnion sample will be collected first while the tech keeps the vessel from drifting. Both hypolimnion and epilimnion samples are collected, from approximately 56 metres and 6 metres deep respectively. The biologist transfers the water into the appropriate bottles and stores them in a cooler. Later, in a laboratory, these samples will undergo various analyses to determine the presence and concentrations of ions, nutrients, metals, and bacteria. As he’s transferring the samples, I’m alerted to another challenge of water quality monitoring: we’re in a confined space, and it’s rocking back and forth. 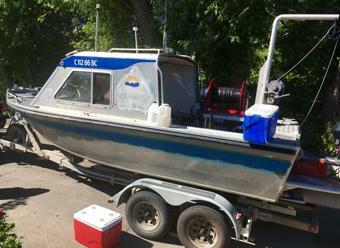 This boat is equipped with two winches, toolboxes, safety equipment, coolers for the samples, and three people – there isn’t much room to move around, and handling the samples requires balance and movement to counter the effects of the waves. The final collection before we depart the deep station is zooplankton – the tiny animals that live in the water. The technician lowers a large cone-shaped net into the water to 25 metres, and slowly hauls it up. At bottom end of the net is a collection cup teeming with tiny creatures that to my naked eye don’t look like much more than some silt and sludge. The sample is transferred to containers, and it will later be analyzed for taxonomy (i.e., species) and approximate abundance. With all gear and samples stowed on board, our deep station monitoring is finished for today. Typically, several deep stations are monitored in one day, but today the crew has to investigate an arising issue elsewhere. We head toward our next monitoring locations in Salmon Arm Bay. We’re going to collect samples from three "impact assessment sites" that are required as part of monitoring the impacts of the Salmon Arm municipal wastewater treatment plant. We will collect samples from a "far field" site near Christmas Island that’s several hundred metres from the plant’s discharge pipe; a "near field" site 100 metres from the discharge pipe, also known the "initial dilution zone"; and a site that’s at the end of the discharge pipe. Upon arriving at the far field site, many of the same procedures at the Sandy Point deep station are repeated: the sonde gives us readings for dissolved oxygen and temperature; water samples are collected in bottles to be analyzed for nutrients, bacteria, ions, and metals; and a Secchi Disk measurement is taken. An additional water sample is collected at this site for nonylphenols. This is a new monitoring project for 2017; nonylphenols have not been monitored in the Shuswap until now. This is a project of interest being led (and paid for) by the Shuswap Watershed Council; this monitoring is not required by government regulators. Nonylphenols is the name given to a group of synthetic compounds that are commonly found in industry and consumer products such as plastics, rubber, detergents, shampoos, cosmetics, household cleaners, latex paints, lubricants, pesticides and surfactants. In addition to being commonplace and therefore likely to be present in wastewater, they can be toxic to aquatic life at certain concentrations in the environment. The purpose of the nonylphenols monitoring project is to determine if they can be detected at any of the impact assessment sites; and if so, what the concentrations are and how they compare to water quality guidelines. For more on the monitoring of nonylphenols, see Water Quality Data. The collections at the three impact assessment sites are relatively quick – the water is shallow. Our monitoring on Shuswap Lake is wrapped up for the day. We head back to the launch, where I’m free to return to Kamloops – full of new knowledge and appreciation for the labour and technology that goes into monitoring the Shuswap… and feeling thankful that I got to participate on a warm day in June, and not a cold day in November.